Looking for suitable jokes for your kids, these jokes must be devoid of any form of dirty languages and must not in any way send the wrong signal to the kids. These kind of jokes are hard to come across. Now that your little kid’s sense of humour has progressed, now that he or she has started to appreciate more complex riddles and jokes, we have decided to compile a list of good and funny jokes kid-friendly jokes to make your child laugh. 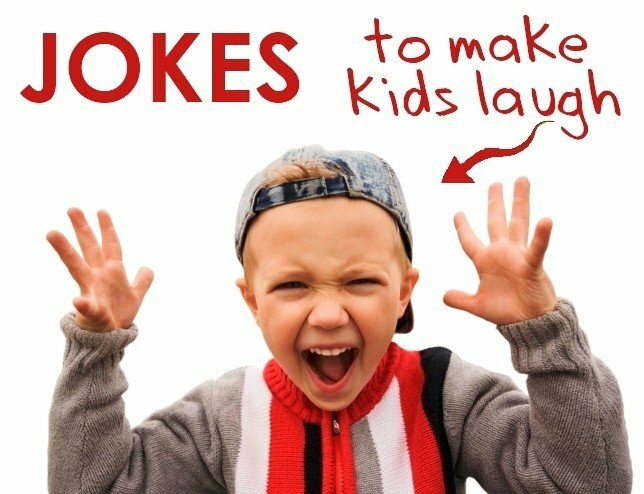 Kids love to tell jokes, find all the best kids’ jokes that will have them in stitches, these include riddles, knock-knock jokes, scary jokes and several more. 1. Q: Why did the boy bring a ladder to school? 2. Q: Where do pencils go on vacation? 3. Q: Why do bananas have to put on sunscreen before they go to the beach? A: Because they might peel! 4. Q: What did Bacon say to Tomato? 5. Q: What is the most hardworking part of the eye? 6. Q: How do you make a tissue dance? 7. Q: What do you call cheese that’s not yours? 8. Q: Why did the birdie go to the hospital? 9. Q: What do you call someone who is afraid of Santa? 10. Q: What sound do porcupines make when they kiss? 11. Q: Why can’t your nose be 12 inches long? 12. Q: What has four wheels and flies? 13. Q: What starts with a P, ends with an E, and has a million letters in it? 14. Q: What did the traffic light say to the car? 15. Q: What do you call cheese that is not yours? 16. Q: What streets do ghosts haunt? 17. Q: What do you call a guy who never farts in public? 18. Q: What do you call a bear with no socks on? 19. Q: What can you serve but never eat? 20. Q: What kind of key opens a banana? 21. Q: How do you know that carrots are good for your eyesight? 22. Q: Why does a hummingbird hum? A: It doesn’t know the words! 23. Q: Why did the child study in the airplane? A: He wanted a higher education! 24. Q: What can go up a chimney down, but can’t go down a chimney up? 25. Q: Why was the broom late? 26. Q: Why is a baseball team similar to a muffin? 27. Q: What did the alien say to the garden? 28. Q: Why do watermelons have fancy weddings? 29. Q: What happens if life gives you melons? 30. Q: What did the stamp say to the envelope? 31. Q: What kind of lights did Noah use on the Ark? 32. Q: What’s taken before you get it? 33. Q: What concert costs 45 cents? 34. Q: Why did the tree go to the dentist? 35. Q: What do prisoners use to call each other? 36. Q: Where do snowmen keep their money? 37. Q: What washes up on very small beaches? 38. Q: What do you call security guards working outside Samsung shops? 39. Q: What do you get when you cross fish and an elephant? 40. Q: Where do bees go to the bathroom? 41. Q: What kind of bed does a mermaid sleep in? 42. Q: What kind of crackers do firemen like in their soup? 43. Q: Why did the barber win the race? 44. Q: Why did the boy sprinkle sugar on his pillow before he went to sleep? 45. Q: Why did the robber take a bath? 46. Q: What happens if life gives you melons? 47. Q: What does a nosey pepper do? 48. Q: What do you call a fake noodle? 49. Q: What do you call an alligator in a vest? 50. Q: What did the little mountain say to the big mountain? 51. Q: What did Winnie The Pooh say to his agent? 52. Q: Why couldn’t the pirate play cards? 53. Q: What dog keeps the best time? 54. Q: What did the man say to the wall? 55. Q: Why did the tomato turn red? 56. Q: Why did the boy tiptoe past the medicine cabinet? 57. Q: What do you get when you cross a fridge with a radio? 58. Q: What goes up when the rain comes down? 59. Q: What is an astronaut’s favorite place on a computer? 60. Q: What exam do young witches have to pass? 61. Q: What do you call a sheep with no head and no legs? 62. Q: Which weighs more, a ton of feathers or a ton of bricks? 64. Q: Where do bulls get their messages? A: On a bull-etin board. 65. Q: When do you stop at green and go at red? 66. Q: How did the farmer mend his pants? 67. Q: Why did the man lose his job at the orange juice factory? 68. Q: How do you repair a broken tomato? 69. Q: Why did the traffic light turn red? 70. Q: What did one elevator say to the other elevator? 71. Q: What do you say when you lose a wii game? 72. Q: How do you make an Octopus laugh? 73. Q: Why did the computer go to the doctor? 74. Q: Why are frogs so happy? 75. Q. What do you get when you cross a cow and a duck? 76. Q: What did the painter say to the wall? 77. Q: Why do golfers wear two pairs of pants? 78. Q: Why did Goofy put a clock under his desk? 79. Q: Why did Johnny throw the clock out of the window? 80. Q: What do bulls do when they go shopping? 81. Q: What runs but can’t walk? 82. Q: When’s the best time to go to the dentist? 83. Q: What did the janitor say when he jumped out of the closet? 84. Q: Why did the scientist go to the tanning salon? A: Because he was a paleontologist. 85. Q: Why was the student’s report card wet? 86. Q: How many tickles does it take to make an octopus laugh? 87. Q: What goes through towns, up & over hills, but doesn’t move? 88. Q: Why was there thunder and lightning in the lab? 89. Q: Why did Tony go out with a prune? 90. Q: What happens if you eat yeast and shoe polish? 92. Q: Did you hear about the race between the lettuce and the tomato? 93. Q: What do you get from a pampered cow? 94. Q: What did the grape do when it got stepped on? 95. Q: What did the judge say when the skunk walked in the courtroom? 96. Q: What did the fish say when he swam into the wall? 97. Q: Why don’t skeletons fight each other? 98. Q: Why can’t a leopard hide? 99. Q: What do you give a dog with a fever? 100. Q: What do you get when you cross a cat with a lemon? 101. Q: Why do birds fly south for the winter? 102. Q: Why did the baby strawberry cry? 103. Q: What was the Cat in the Hat looking for in the toilet? 104. Q: What did the hamburger name his daughter? 105. Q: What kind of egg did the bad chicken lay? 106. Q: What did the blanket say to the bed? 107. Q: Why should you take a pencil to bed? 108. Q: How many books can you put in an empty backpack? 109. Q: Did you hear they’re changing the flooring in daycare centers? 110. Q: What do lawyers wear to court? 111. Q: What gets wetter the more it dries? 112. Q: What did the pencil say to the other pencil? 113. Q: Why is England the wettest country? 114. Q: Why do fish live in salt water? 115. Q: Why did the man put his money in the freezer? 116. Q: What did the penny say to the other penny? 117. Q: Why did the man with one hand cross the road? A: To get to the second-hand shop. 118. Q: What did the judge say to the dentist? 119. Q: Why did the belt go to jail? 120. Q: Why was the guy looking for fast food on his friend? 121. Q: Did you hear the joke about the roof? 122. Q: Why didn’t the skeleton go to the dance? 123. Q: How do crazy people go through the forest? 124. Q: Have you heard the joke about the butter? 125. Q: How do baseball players stay cool? 126. Q: Why was the math book sad? 127. Q: What runs but doesn’t get anywhere? 128. Q: What kind of key opens the door on Thanksgiving? 129. Q: Why did the cookie go to the hospital? 130. Q: Why were the teacher’s eyes crossed? 131. Q: Why did the picture go to jail? 132. Q: What do you call a baby monkey? 133. Q: Who earns a living driving their customers away? 135. Q: How do you drown a Hipster? 136. Q: Why don’t you see giraffes in elementary school? 137. Q: Which is the longest word in the dictionary? 138. Q: Which month do soldiers hate most? 139. Q: What bow can’t be tied? 140. Q: What season is it when you are on a trampoline? 141. Q: Where did the computer go to dance? 142. Q: What has one head, one foot, and four legs? 143. Q: What kind of button won’t unbutton? 144. Q: Why do sea-gulls fly over the sea? 145. Q: What kind of shoes do all spies wear? 166. Yo mama is so ugly, she went to a haunted house and came out with a job application. 167. Yo mama is so old, her birth certificate reads: “Expired”. 168. Yo momma is so fat, people jog around her for exercise. 169. Yo mama is so fat, she tripped over a rock and fell asleep trying to get up. 171. Yo mama is so fat, the army stole her pants for a parachute. 172. Yo mama is so fat, when she wears one of those X jackets, helicopters try to land on her. 174. Yo mama is so ugly, when she walked into a bank, they turned off the cameras. 175. Yo mama’s teeth are so yellow, traffic slows down when she smiles. 176. Yo mama is so old, she knew Burger King when he was a Prince. 177 Yo momma is so fat, when she gets on a scale it says… to be continued. 178. Yo mama is so stupid, she went to the orthodontist to get a Bluetooth. 179. Yo momma is so fat, when she went to space, NASA said they found a new planet. 180. Yo mama’s house is so small, she ordered a large pizza and had to eat it outside. 181. Yo mama is so skinny, she hula hoops with a Cheerio. 182. Yo mama is so poor, she went to McDonald’s and put a milkshake on layaway. 183. Yo mama is so old, she ran track with dinosaurs. 184. Yo mama is so fat when she wears her grey swimsuit at the beach the whales call her name. 185. Yo mama is so fat, her belly button has an echo. 186. Yo mama is so fat, when she walks in front of the TV, you miss 20 minutes of your show. 187. Why do plants hate math? Because it gives them square roots. 188. Why did the boy eat his math homework? Because the teacher told him it was a piece of cake. 189. Have you heard the latest statistics joke? Probably. 190. What did the acorn say when it grew up? Geometry. 191. What do you call an empty parrot cage? Polygon. 192. Cakes are round but Pi are square. 193. What do mathematicians eat on Halloween? Pumpkin Pi. 194. Why did the math book look so sad? Because it had so many problems. 195. A circle is just a round straight line with a hole in the middle. 196. How can you make time fly? Throw a clock out the window! 197. What did you learn in school today? 198. What’s the king of the classroom? 199. What do librarians take with them when they go fishing? 200. What subject in school is easy for a witch? 201. What did the computer do at lunchtime? 202. Why did the teacher wear sunglasses? 203. Why was the teacher cross-eyed? She couldn’t control her pupils! 204. Where did the music teacher leave her keys? 205. What is snake’s favourite subject? 206. What is a pirate’s favourite subject? 207. What do you call a pirate that skips class? 208. What did the tree say to the math teacher? 209. What did the pen say to the pencil? 210. How do you get straight A’s? 211. What vegetables do librarians like? 212. Why does it take pirates so long to learn the alphabet? 213. What grades did the pirate get in school? 214. Why did the kid study in the aeroplane? 215. Why did the clock in the cafeteria run slow? 216. Why was the math book sad?